Do you sometimes feel that you don’t truly understand contemporary issues and topics around gender identity? Do you want to know more about the most recent understandings of gender, why it’s changing, and how to best keep up to date? Or perhaps you want to know more in order to support someone in your life, including a gender expansive teen? The Parents’ Coalition has organized a panel of experts who will answer your questions about gender. The event will start with a “101” on the basics that clarifies the difference between identity, orientation, and expression, and gives an overview of the experiences and needs of gender expansive students. It will explain why some language, terms, and ways of thinking about gender are on their way out, and highlight key issues in today’s politics of gender, particularly among high schools in the Bay Area. 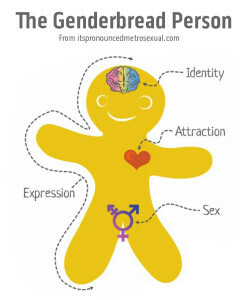 Gender Spectrum’s mission is to create a gender-inclusive world for all children and youth. To accomplish this, we help families, organizations, and institutions increase understandings of gender and consider the implications that evolving views have for each of us. Pamela Wool, Director of Family Services and Administration, facilitates the Gender Spectrum support groups for parents/caregivers, provides support to Gender Spectrum families throughout the year, and creates the online programming for adults raising transgender, non-binary and other gender-expansive kids. She has been involved in gender-related issues since earning her B.A. in Women’s Studies at Brown University. She continued her social justice work as a legal aid attorney after earning her J.D. at University of California, Hastings College of the Law. Ilana Sherer, MD, FAAP is a pediatrician and founder of the Child and Adolescent Gender Center at University of California San Francisco (UCSF) Benioff Children’s Hospitals. Sherer serves as its Assistant Medical Director, caring for transgender children and adolescents at its Oakland site. She is also HS Assistant Clinical Professor of Pediatrics at UCSF. She received the UCSF Chancellors Award for GLBT Leadership and the American Academy of Pediatrics (AAP)’s Anne E Dyson Child Advocacy Award for this work. She has developed health care provider modules related to caring for GLBT and gender variant youth, and presents nationally to medical and lay audiences on these topics. Dr. Sherer served on the Editorial Board for the national Trans Bodies, Trans Selves book project, a resource guide for the transgender community and works with families and youth on self-advocacy skills within the medical setting. She has also worked with the AAP to improve care for gender non-conforming youth, and is a founding member of the Section on Lesbian, Gay, Bisexual, Transgender Health and Wellness. She has written and contributed to numerous articles for both professional and lay media, including Pediatrics, Pediatrics in Review, Health Affairs, and Contemporary Pediatrics. Door ticket prices: Member School Parents $10.00; Others $15.00. Save now and buy online! Do you want to be a Member School? Join with other Bay Area High Schools to sponsor speakers and events that can help support parents/guardians and students during the high school years.